CO2 Laser is one of the most powerful and effective lasers for skin rejuvenation and skin resurfacing. CO2 laser is known by many brand names such as Cortex , Fraxel, Fractional, ProFractional, eMax/eLaser Matrix, Pixel CO2, SmartXide, UltraPulse, Affirm CO2, eCO2 and more. During treatment with Fractional CO2 laser, tiny yet powerful laser beams penetrate skin in tightly controlled patterns with precise depth and width, stimulating body healing process and leading to substantial rejuvenation of the skin. During Fractional CO2 laser treatment, laser is used to deliver therapeutic heat into skin in a controlled manner. Tiny beams of laser with precise width and depth are delivered at calculated intervals. Each beam of laser works its way by ablating a tiny column of tissue, leaving intact areas of skin in-between the beams. These localized areas of ablation and the delivered heat activate the inherent healing capacity of the skin, spearheaded by fibroblasts, that stimulates the production of new collagen and elastin fibers and rearrangement and realignment of existing collagen. The new and newly arranged collagen reduces lines, grooves and wrinkles, tightens the skin, and improves the skin tone, texture and color. Who Is the Right Candidate for Fractional CO2 Laser? 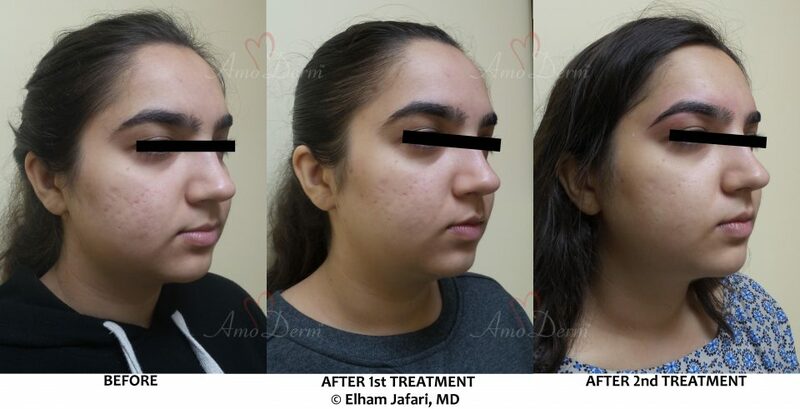 Selection of the right patients and having right understanding of the treatment and realistic expectations of the treatment results are key to successful Fractional CO2 laser. At Amoderm, we invite all patients interested in performing CO2 laser to come in for a complimentary consultation during which we carefully examine your skin and discuss your health and skin conditions and the endpoints you would like to achieve. 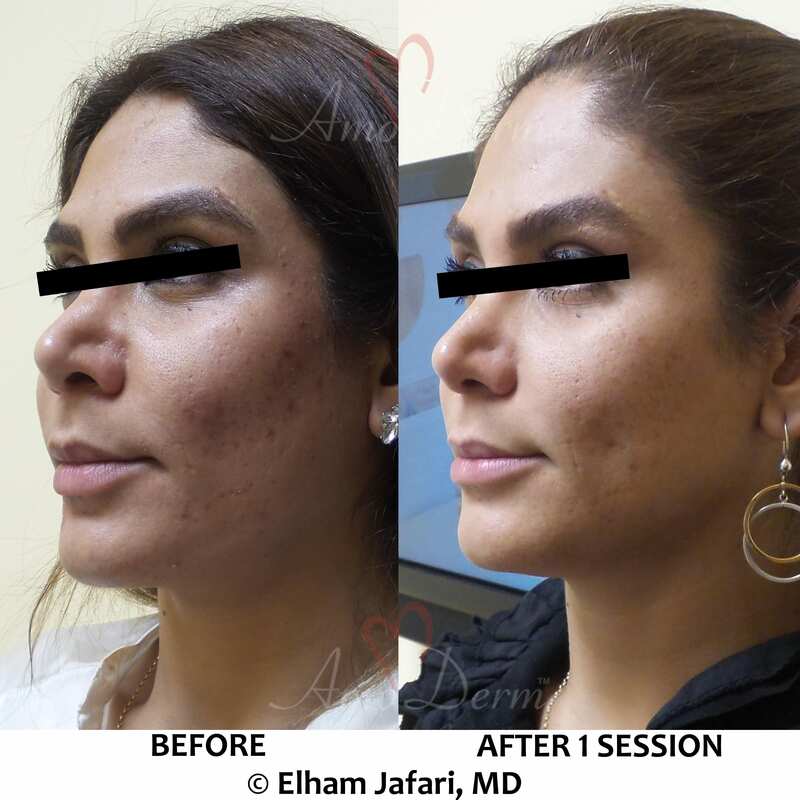 In general, Fractional CO2 laser is best for patients with lighter skin types (Skin Type I-III), but it can also be performed on patients with darker skin tones (Skin Type IV) with optional pre-treatment application of skin bleaching creams. Are There Patients Who Should Not Be Treated with Fractional CO2 Laser? Like any other medical treatment, Fractional CO2 laser is not right for everyone. Examples include (but at not limited to) patients who are pregnant or nursing, patients with poor general health status such as those with severe uncontrolled diabetes, patients with weakened skin (e.g. due to recent radiotherapy, deep peels or burn scars), patients taking certain drugs and medications such as Acutane, patients with certain medical conditions such as chronic immunodeficiency or autoimmune diseases, patients with history of bleeding disorders or those taking anticoagulants. It is also important to remember that as aging is a continuous process occurring over years, anti-aging treatments also require time, patience and commitment to achieve satisfactory results. At Amoderm, we work closely with our patients to know their concerns and make sure their expectations are aligned with what can be expected from Fractional CO2 laser treatments. Adhering to pre- and post-care instructions is also critical to achieving best results and avoiding complications. Pain is a subjective matter and different people may respond differently. At Amoderm, we generally use topical medical-grade numbing and anesthetic creams to maximize patient comfort during the laser treatment. What Is Expected after CO2 Laser? During the days following the laser treatment, it is important to closely follow the post-case instructions that will be given to you. Following Fractional CO2 laser as your body’s inherent healing process is activated, regeneration and realignment of collagen usually occur over the next 60-90 days. Hence additional treatments are usually recommended to be spaced 90-180 days later. Can Fractional CO2 Laser Be Used for Asian Skin Types? Asian skin types are usually classified as skin type IV and require additional caution for best results and minimizing side effects (including pigmentation changes). At Amoderm, we specialize in treatment of these skin types. The recommended course of treatment usually includes preparatory treatment with our customized medical-grade bleaching cream (Amoderm Bright & Tight) in the weeks before the laser treatment. Drinking adequate water and being well hydrated on the day of laser treatment is very important. You Amoderm clinician will carefully selected the laser treatment settings to maximize results while minimizing the risk of complications. 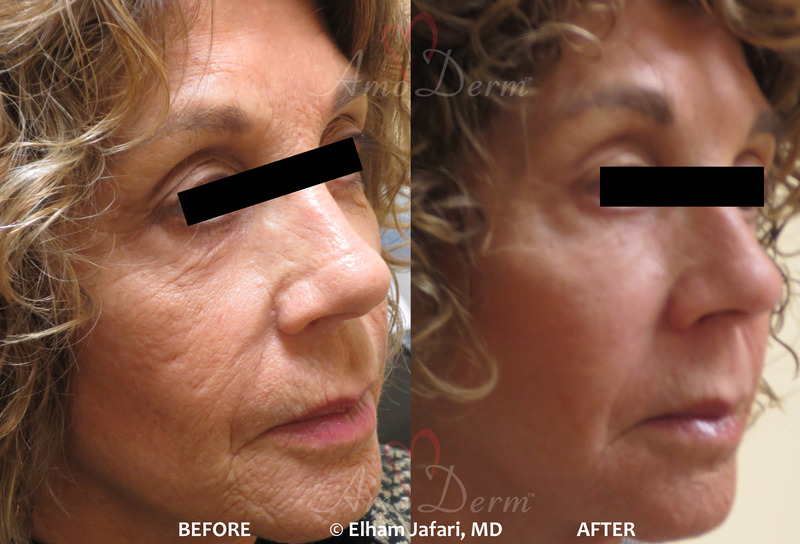 What is the Difference between Fractional CO2 and Erbium Laser Skin Resurfacing? 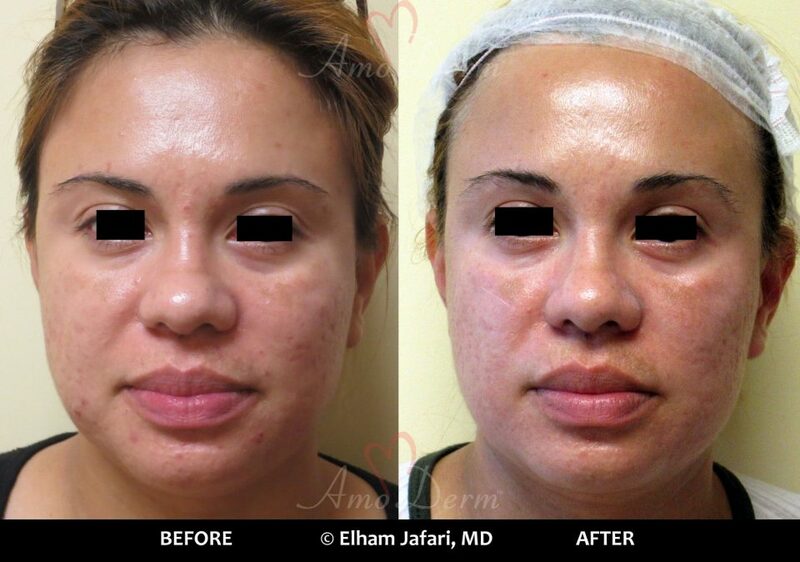 At Amoderm, we offer both Fractional CO2 laser and Erbium Laser Skin Resurfacing (MicroLaser Peel). Both are excellent choices for skin rejuvenation and treatment of many common skin problems. The laser energy in Fractional CO2 laser is usually higher and penetrates deeper and hence the effects can be more pronounced (so is the downtime). 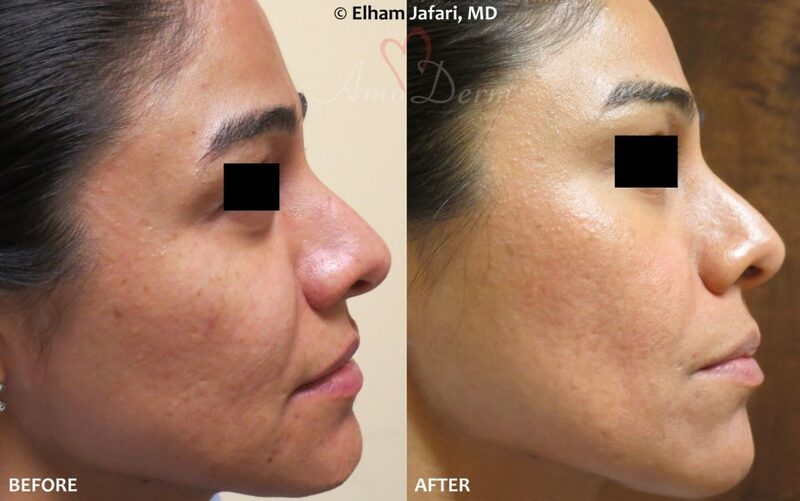 Additionally, the laser energy used in Erbium Skin Resurfacing is delivered uniformly to the skin, removing a superficial layer of the skin, while the laser in Fractional treatment is delivered in tiny beams covering a fraction of the skin surface (hence the name) and penetrating deeper into the skin. In general, Fractional CO2 is used for the treatment of skin aging, photo-aging, sun-damaged skin, lines and wrinkles, large pores, acne scars, irregular skin texture and melasma. 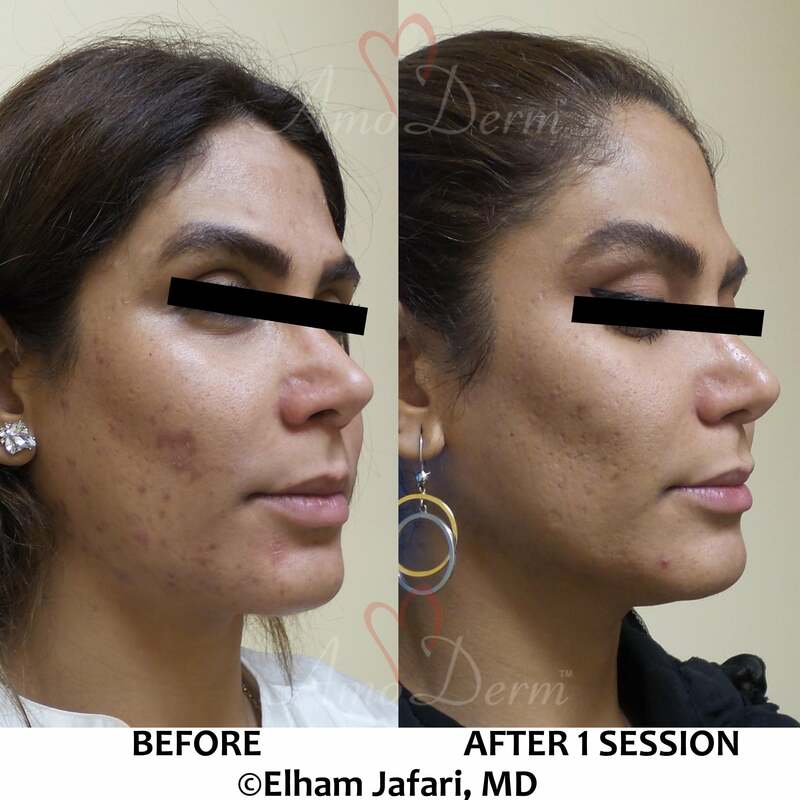 Erbium Laser Skin Resurfacing is generally used for the treatment of skin aging, skin discolorations and pigmentation changes (Actinic Dyschromias), photo-aging and sun-damaged skin, lines and wrinkles, large pores, irregular skin texture and sallow skin color in addition to other conditions. As can be seen, there are some overlaps between the conditions treated by these two methods, and they can be viewed as complementing each other. 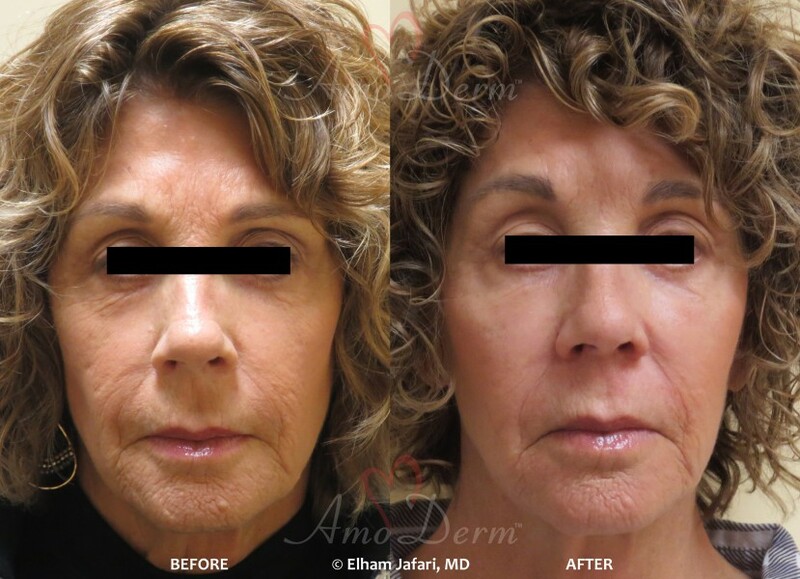 At Amoderm, we can combine Erbium Laser Skin Resurfacing and Fractional CO2 Laser treatments together to address various skin problems at superficial and deeper skin levels. These and other treatment options will be discussed with you during the complimentary consultation to make sure you chose the treatments best suited to your specific needs. What Is the Difference between Fractional CO2 Laser and Microneedling? Micro-needling is another excellent anti-aging treatment choice. During both procedures, tiny channels are introduced into the skin at controlled depth and intervals, spaced with untreated skin in-between. 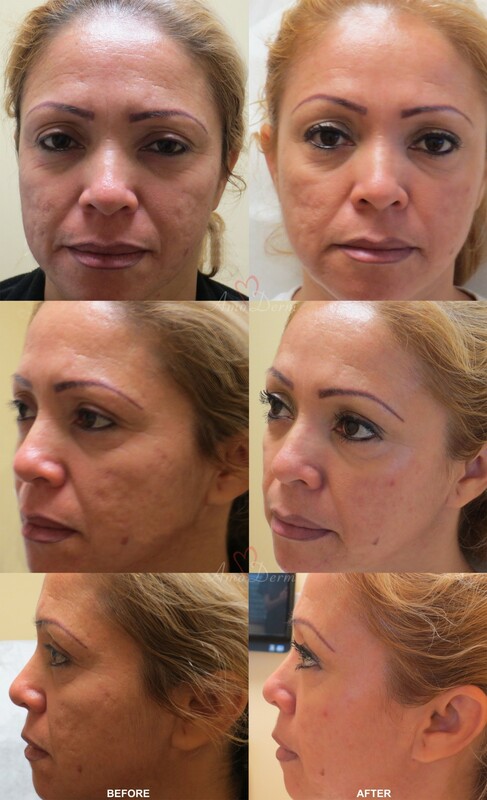 This is done by a mechanical action of small needles in Microneedling, or laser beams in Fractional laser treatment. However, the generated heat during Fractional laser treatment will coagulate and stop bleeding, which can allow your clinician to deliver higher levels of therapeutic energy. As a result, Fractional CO2 laser can be a more effective treatment, but it can also have a longer downtime and healing period. These and other treatment options will be discussed with you during a complimentary consultation. What Is the Difference between Various CO2 Lasers? As previously indicated, CO2 laser is known by many brand names such as Cortex, Fraxel, Fractional, ProFractional, eMax / eLaser Matrix, Pixel CO2, SmartXide, UltraPulse, Affirm CO2, eCO2 and more. To be legally marketed in the U.S., all these devices must be thoroughly tested and verified to be safe and effective and be approved (cleared) by the FDA. Clinical studies are performed to show that each device is equivalent to others and capable of providing the intended treatment and results. All these devices share the common source and type of laser – carbon dioxide laser – and are capable of providing effective skin rejuvenation. At Amoderm, we only use FDA-approved (cleared) medical CO2 lasers for your treatment.